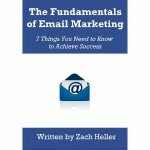 Get a free copy of my book, The Fundamentals of Email Marketing, just for subscribing to my monthly newsletter. It’s simple, just subscribe to my newsletter list, and then send me an email at ztheller (at) gmail (dot) com with the subject line “Free Book”. I will reply to you with a digital copy of my book. a great beginners guide to email marketing! Very clear and concise. Definitely recommend to those getting into the email marketing biz! I read this book and it is great for anyone like me, who is a beginner/intermediate level person. Learning the basic concepts in the book made it so I could run my campaigns. Can't say how they turned out yet, since I just started, but I have my fingers crossed and I am feeling confident.